When I first started keeping this blog, I didn’t know a thing about web design, HTML or CSS. I’ve had a rough road learning enough to get this running smoothly and looking pretty. Remember when we were kids and the only computer science class involved learning to type? I didn’t even take typing! Today, typing skills are not going to cut it. 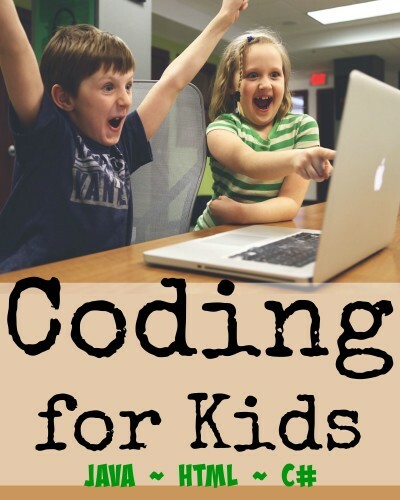 I am really wanting to teach my kids as much about computer science as possible, and am so glad Homeschool Programming has created programs, like KidCoder: Beginning Web Design, which makes programming for kids easy! Homeschool Programming has courses for both children, and teenagers. Courses include Web Design, Visual Basic and Game Programming, C+, Java and Android programming. The courses are all offered in book form, and have video components, which are an optional, but useful supplement to the courses. These courses come with everything you need to use them- they rely on free programs that either come with your computer or can be downloaded easily. You can see the technical requirements to use Homeschool Programming on their website. The course I have is the KidCoder: Beginning Web Design. This course is the first of the Kid’s web design series and is meant to take one semester to complete. It is written for kids in grades 4-8, and I feel like that age recommendation is dead on. Bug is still a little young for this course, but *I* learned so much from it- I can’t wait to use it with him in a year or so. This course covers files and directories, HTML, backing up websites, body elements, content, navigation, hyperlinks, CSS, stylesheets, branding, positioning, graphics, tables and SO much more. This isn’t a how to use a drag and drop program either, we’re talking about programming all these elements to create a functional website. The set up of the book is very nice- pages are well organized and clean. It really bothers me when pages are cluttered, and with a program like this where you have to read closely, it’s important for it to be easy on my eyes. As I was reading the instructions, I was really impressed with the step by step guidance. When a step is given to you, the book outlines exactly what code you are writing, and where. Even as a total novice, I never felt lost. When it comes to actually seeing your code work, KidCoder has visual examples of the result you should get. Everything is clearly laid out. It comes with a parent solution manual, so even a parent who knows nothing about programming can check their student’s work and see that it was done correctly. While the course is designed to be stand-alone, you can purchase videos which will give your student added clarification and support as they work through the program. The videos are still reliant on the workbooks, so they can not be used separately, but do make a wonderful supplement. KidCoder: Advanced Web Design is the second half of this course, and will be released in just a few short weeks. 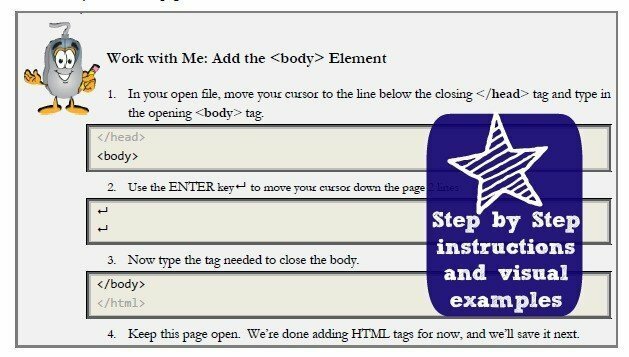 It is supposed to take the class to the next level, and will include instructions on HTML5, CSS3, and Java Script to really snazz up your website. I can not *wait* until this program is released. I am going to need to pick it up for ME! Homeschool Programming is fabulous, and has gained a spot in my Homeschool library. I can not wait to use this with the kids, and in the meantime, I am using it for myself to learn more about web design. The contents are well laid out and clean on the eyes. The instruction is well incremented and clear. It is easy to tell what steps you should be taking, and there are visual examples of both the code, and the final products. This is appropriate for kids in the 4th-8th grades, but other crew members used this program, and all of the other Homeschool Programming classes- so click the crew banner below to read about their experiences! I am sure you can find a course perfect for your kids! 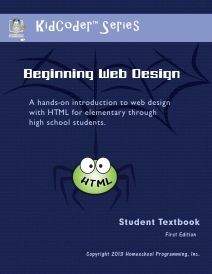 KidCoder: Beginning Web Design is available for $70.00 for the course book, $20 for the videos, or $85 for a combo pack. I received a PDF version, which was made specially available to reviewers only. Okay! This looks awesome. I’ll keep this in mine in a year or two! (Or maybe sooner, because I could use it myself!